....receive your check 2 weeks after the event ends! Families that sell with us at Lynnwood/Mill Creek earn an average of $300 at each sale! So what are you waiting for? Register NOW to consign at JBF Lynnwood! Being a Team Member and helping out witht the sale is a lot of fun! It also comes with some great perks! PLEASE NOTE: Do to space at our event, YOU MUST have a Drop Off Ticket to hold your spot to consign. Have you double checked the "What To Bring" List? Place your items in the Zone they belong in. Done! Be sure to check out the SPRING "What to Bring"
We will inspect your items after you leave and we will place them out on the floor for you! Please mark you calendars for this important date & time. All items that are not picked up by 8:01 pm, will be donated to our charity partner. Diaper bags, infant carriers, backpacks, and purses are great consignment items. Please inspect all carefully to make sure items have not been recalled, stained, damaged or are missing pieces. Package Tip: Please zip-tie items to an adult-size hanger. Tagging Tip: Hole-punch JBF tag and attach it to item with ribbon or string. If item contains multiple pieces, be sure all pieces are included and list number of items on JBF tag description. Bedding sizes accepted through twin only. Please be selective when selling bedding, blankets, receiving blankets, burp cloths, and towels. New and barely used items sell best. Check carefully for stains; shoppers get very disappointed if they find a stain in a bundled blanket once they get home. NOTE: We do NOT accept crib bumpers of any sort. Package: Put bedding/crib/bedroom sets together in original packaging or in giant clear plastic bags. It helps to take a picture of your bedding before packaging it! This helps the shopper know what they are buying. Secure the bag so that items do not get separated. Bundle blankets, cloths, and towels with ribbon or string like a package (be sure multiple pieces cannot be separated). Price: Price to sell! Shoppers are less likely to purchase these items used, so prices have to be low. Tag: If bedding is in a plastic bag, attach tag securely with packaging tape to the inside of the bag and tape the bag shut. If you took a picture of your bedding out of the package, make sure to tape it to the package so people know what it looks like outside of the bag. Be picky. Look at your clothing items as if you were going to purchase them. No stained or damage items will be accepted. Please freshly clean your clothing items. Replace missing buttons, sew loose hems and seams, and clip loose threads. Please button all buttons, snap all snaps, zip all zippers before you arrive at drop off. This will ensure that there are no defects in the clothing. The newer the item looks (and the better it smells), the better it will sell. Package & Hang: Hangers - Please hang clothes so the hanger hook points to the left (like a question mark). Hang size 0-6 clothing on child-size hangers and sizes 7-20 and maternity clothing on adult-size hangers. Clothing that falls off the hanger onto the floor does not sell well. Clothing Sets - Sets tend to sell better (under size 6) so match things up if you can. All garments should be hung with the hanger hook pointing left (hanger should resemble a question mark when looking at the front of item). Safety pin or use a tagging gun to attach clothing sets securely with bottom garment hung on the backside of the shirt, so both pieces can be viewed without separating them. Pants/Shorts- Pant-clip hangers are great but if you use a standard hanger, simply use your tagging gun to attach pants to the top part of the hanger so the garment will not slide. Onesies, socks, tights, hats and infant mittens need to be in a clear zip-lock bag (you may group multiple items in one bag). Please be sure to label your tag well so that customers know if the items are short-sleeve onesies or long-sleeve onesies. Nursing covers & pillows, feeding items, monitors, safety items, diapering & toileting items, rattles, and more. Please check for safety recalls on all items that you consign. Books, book sets, board games, puzzles, video games, video game systems, scrapbook, arts & crafts sets are great items for resale. Please only bring kids’, parenting, homeschooling, pregnancy and child rearing books. Games and puzzles must have all pieces. (No "adult" content please.) Check items to ensure they are in great condition. Make sure that shoes are clean, clean, clean! We will be VERY selective with shoes during Consignor Drop Off & Inspection. Shoes must be current season, please leave sandals, flip flops and other spring/summer style shoes for our spring sale in March. We will not accept shoes in boxes. Here is a helpful video on how to tag & prep your shoes! All furniture and equipment must be assembled during the sale. Batteries must be included, if applicable. Make sure to clean your equipment before dropping off. Don't forget to check for recalls!! Package: If item has multiple pieces use packaging tape, zip-ties, or string to keep items attached together. If wooden furniture has loose parts, use clear plastic wrap to secure item. Want to Consign, but short on time? 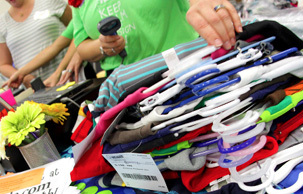 Do you have items to Consign, but don’t have time to tag your stuff? Let one of our VIP Taggers do the tagging for you!! How does VIP Tagging work? Sort your toys, books, baby gear, etc. into boxes/bags that you don't want back. Schedule a meet up with them and your work is DONE! The tagger will then take your items home to be inspected and tagged & hung if needed. Your VIP Tagger will also drop your items off at the sale and place them on the floor. All you need to do is sit back and wait for your check! You will earn 45% of your sold items minus any fees. A VIP waiver will be sent to you with more information on this. Do I still get a presale pass? Yes! You will qualify for a consignor presale pass and you will receive 1 friend pass. Do VIP Consignors get to Shop the Consignor Presale? YES!! Your name will be added to the front door list so you can enjoy the perk of shopping early! Can I still join the team to help during the sale and qualify for an earlier presale and an extra 10%? There is NO extra 10% available for VIP Tagging Consignors. Don't you just LOVE a great deal? !